Social networks are inseparable helper in order to attract more traffic to your website, as well as gain trust to your audience and make them to follow or subscribe your posting content. Next important reason is that the amount of your followers, subscribers and fans represents the importance of the content you are sharing with others. In addition, subscribers and followers make essential aspect to the blog or website page rank. And at this point, PostRSS is offering automated content sharing straight to Facebook, Twitter, Linkedin and Vkontakte. 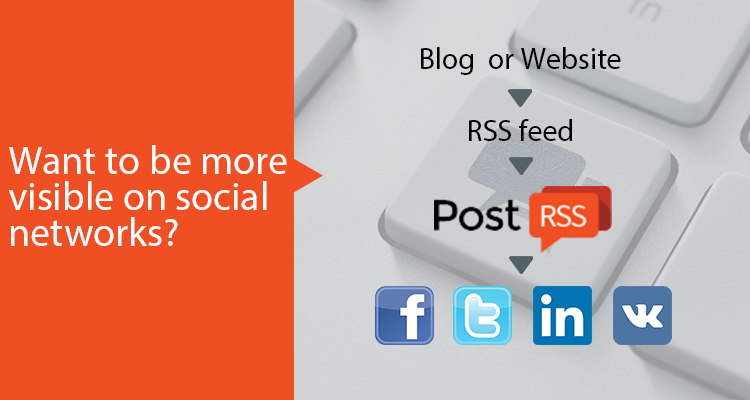 Just add your favourite RSS feeds to PostRSS and get automatic shares on social networks. PostRSS is extremely simple tool, which will save you plenty of time. You can easily change options as maximum posts per update, publishing order, message format and posting frequency. Also, you can choose date you want RSS to start feeding from. PostRSS saves enormous value of time providing traffic and engagement to social network pages, groups and accounts. Choose between personal and business plans and find out what suits you best. Post RSS Feed and CSV file links to Facebook accounts, pages, and groups, Twitter, Linkedin or Vkontakte and post from 50 to 250 million tasks per month. All in all, PostRSS will keep your social network visitors with up to date content from RSS feed and help you to spend your valuable time on other more important tasks of your life!